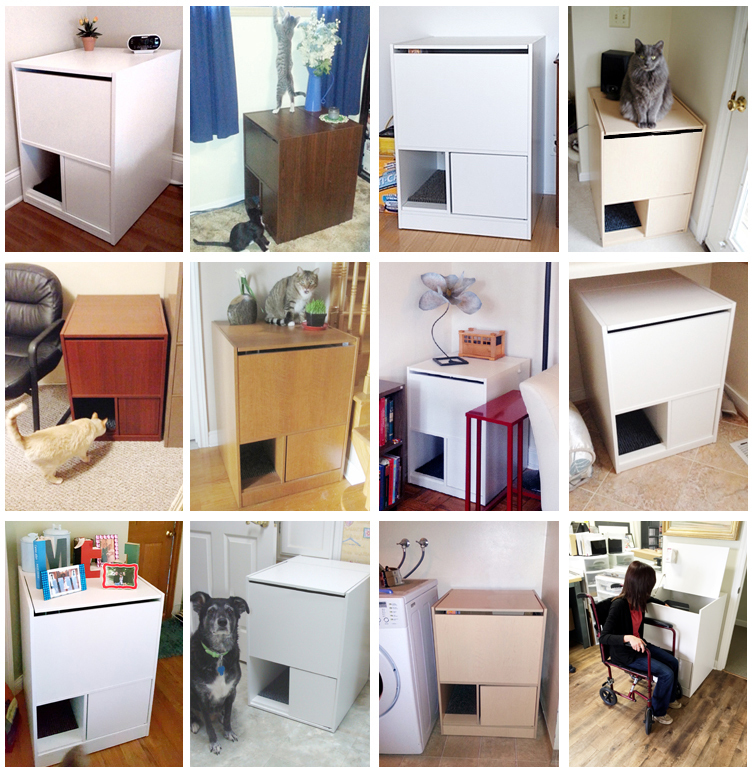 Cat Litter Box Furniture That Really Does Work! You have found the solution to all your litter box problems. 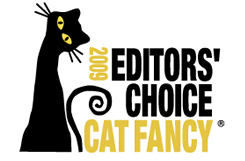 Invented by a multi-cat owner who understands what you have been looking for. 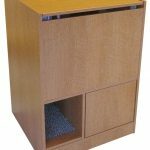 • Hides Kitty Litter Mess: Our hidden litter box makes clean up a snap! Stop wasting time cleaning up litter mess from around your cats litter pan or having to clean up tracked litter from all around your home, apartment or small studio. 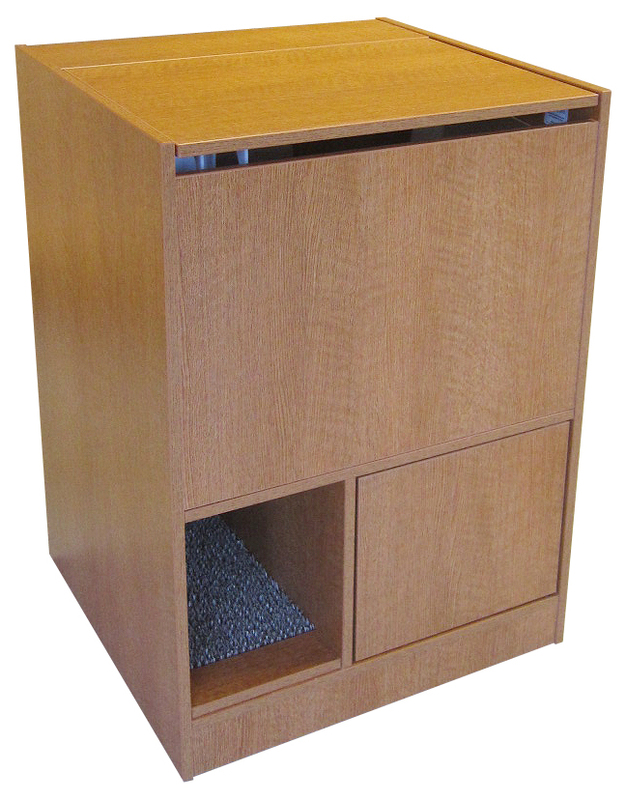 The Out of Sight Litter Box is cat litter box furniture designed to work. • Stops Cat Litter Tracking: Your cat jumps down on exit which opens paws naturally and allows litter to fall out and be trapped in TraxTruf™ that would otherwise be tracked throughout your home. • No More Kneeling to Clean: What is the best cat litter box for odor control? I believe one that contains the odor effectively and is easy to clean. My litter box meets both of these criteria. Walk up, open the top lid, scoop and walk away. The kitty litter box is located off the floor so you won’t have to bend over or kneel on the floor to clean. 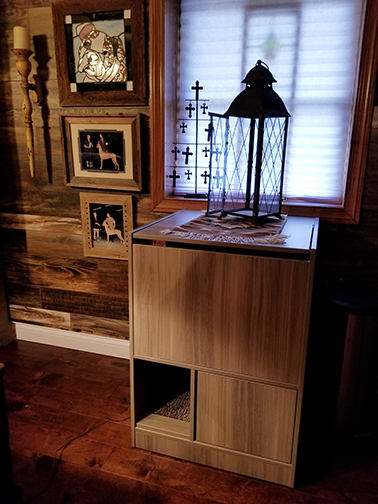 • Keeps Dogs Out of Litter Box: Because cats have more agility and flexibility than dogs, my patented cabinet design keeps the kitty litter box out of reach of most mischievous dogs or inquisitive children. Dog proof your litter box – out of sight, out of mind. • Wheelchair Accessible: YES! 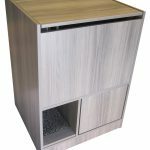 With the litter pan located on a raised shelf inside the Out of Sight Litter Box cabinet, scooping the litter pan is accessible if seated in a wheelchair. Daily cleaning, scooping can be done by raising the Top Lid and reaching in, which makes the cabinet a wheelchair accessible litter box. Stop wasting your time cleaning up litter mess from around your cats litter box or having to clean up tracked litter from all around your home, apartment or small studio. 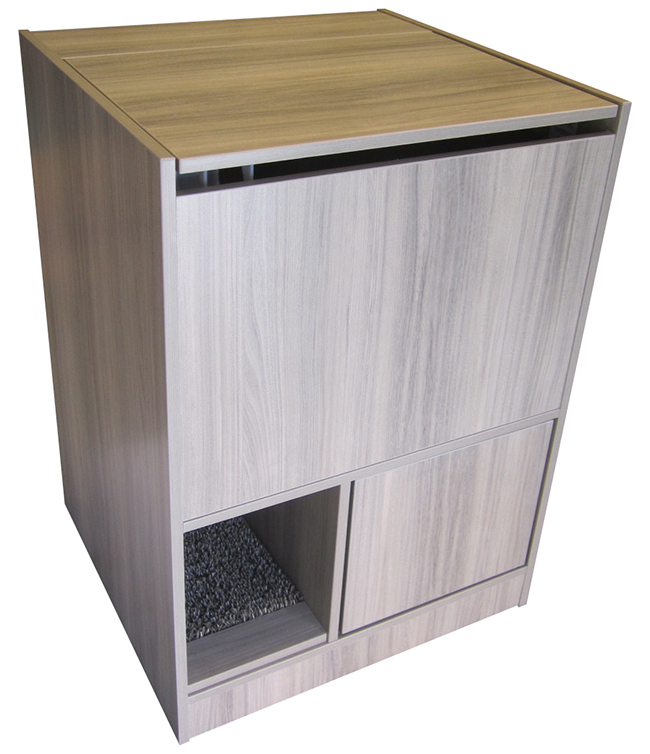 The Out of Sight Litter Box® is cat litter box furniture that is designed to stop kitty litter tracking, hides and contains cat litter pan mess and keeps most dogs and kids out of the litter pan! One minute in the morning, one minute at night is the only time you will spend on cat litter once you own the Out of Sight Litter Box®. 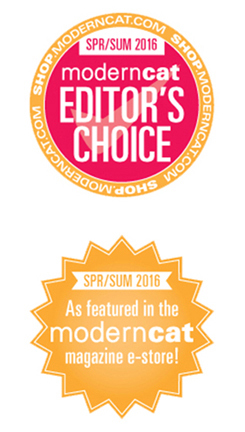 Designed by a multi-cat owner who understands what you have been searching for! 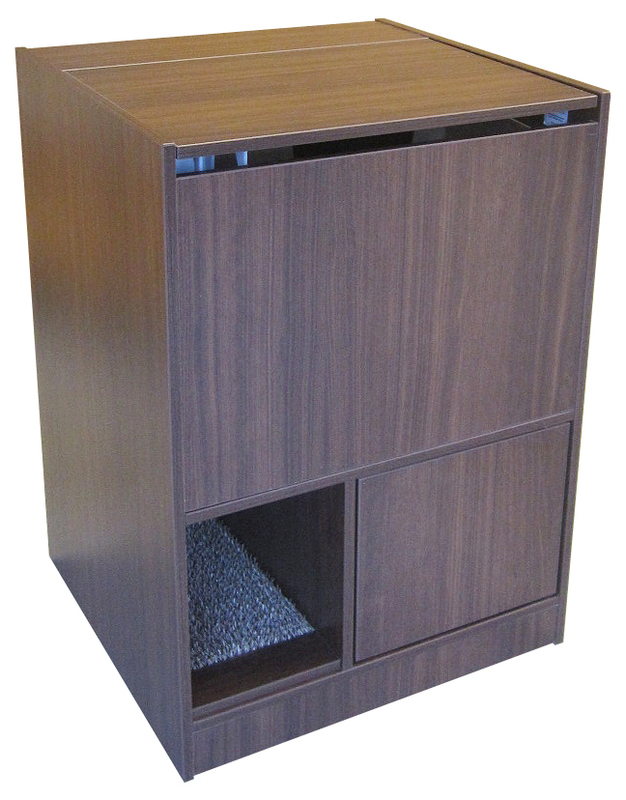 If you are searching for a cat tree, my new Out of Sight Cat Tree (it is a modern design and NOT covered in carpeting) will be available in the next few months – but for now, take a look at my cat litter furniture. 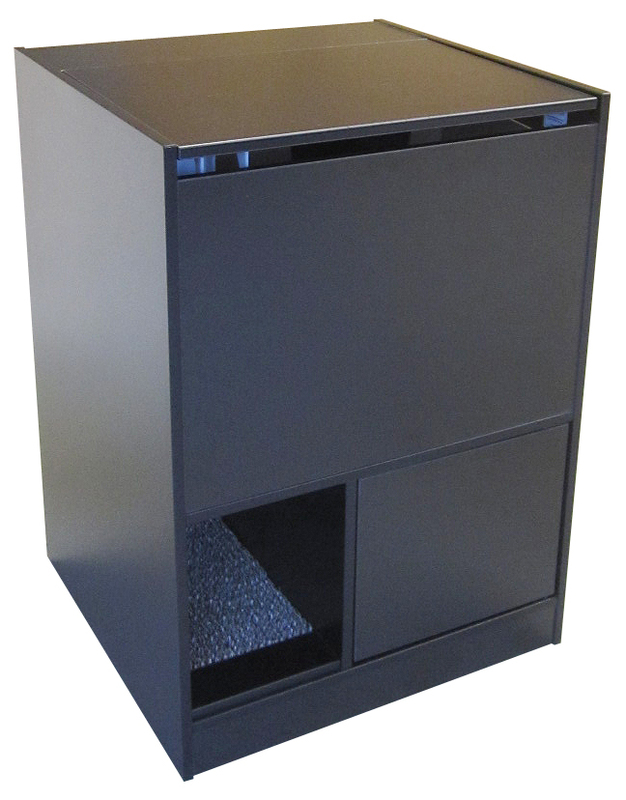 The Out of Sight Litter Box® is a patented, award winning cat litter box cabinet system. Cat litter furniture that really works! Take a look at my customers photographs and read my customer reviews on the Testimonials Page how the Out of Sight Litter Box® has stopped their daily litter cleaning routine. Simply put it is the best cat litter box on the market. 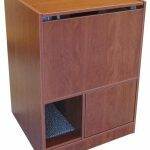 Learn about how it works differently than any other cat litter furniture plus it keeps most dogs out. 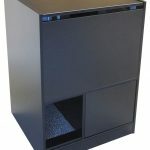 Read the Advantages Page why the manufacturing process using high-grade California approved plastic coat melamine panels with all sealed panel edges makes my cabinet the best in high quality. My cabinet can be located anywhere in a room because the back panel looks as beautiful as the front. 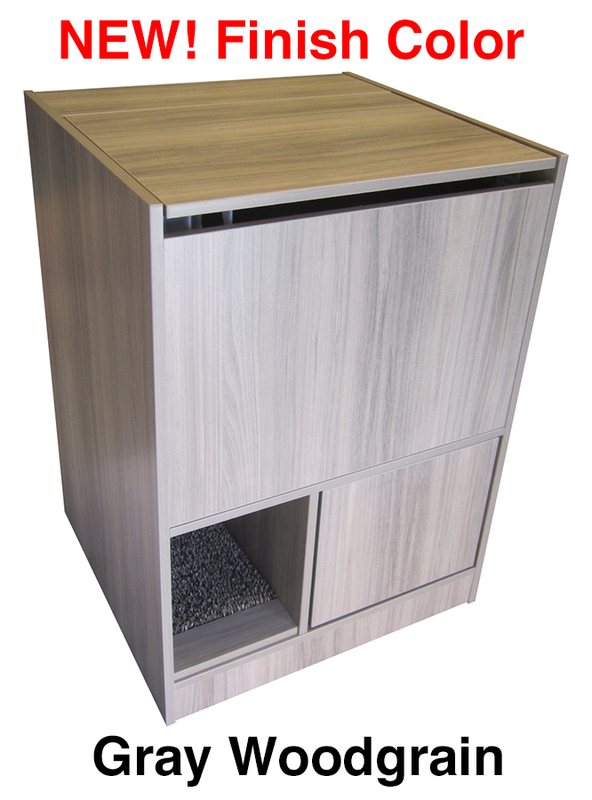 Check out the Dimensions Page to plan where to locate the Out of Sight Litter Box® in your home, apartment or small studio. 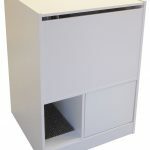 Included with each Out of Sight Litter Box® cabinet purchase are two (2) large (23w x 13d x 15h) custom fit High-Sider™ litter boxes (wax saturated cardboard) that keep kitty from “missing” over the sides. Don’t be concerned about the wax saturated cardboard, each litter box lasts at least 6 months, you can read more about them on the Included Page or Accessories Page. My unique High-Sider™ litter box will keep your new Out of Sight Litter Box® cabinet dry and clean inside. Plus you get TraxTurf™ Pads, a Litter Scoop and an Odor Absorber! 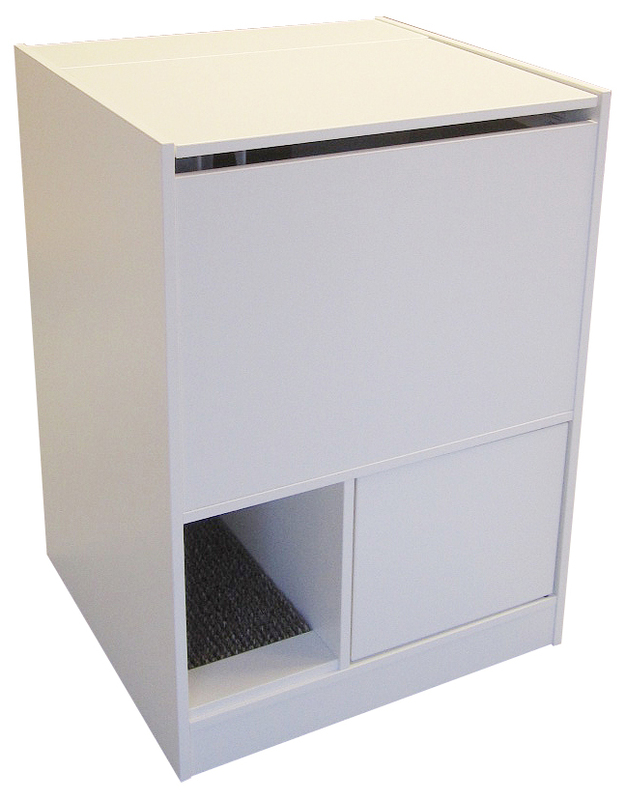 Read more about each included item with your cabinet package order on the Included Page. Note: Mahogany mixes well with any cherry finish.